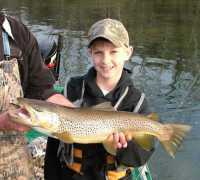 ARKANSAS TROUT FISHING | GUIDED TROUT FISHING TRIPS ON THE WHITE AND BUFFALO RIVERS SINCE 1954.
we make Weekly Video Fishing Reports. (click box in lower right after starting video). Volume slider control only appears when on full screen. Click the image above to go directly to all of our customer reviews on TripAdvisor.com. 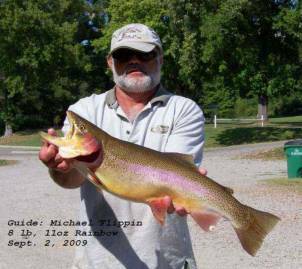 Big Rainbow Trout - usually 11"-16"
A Cotter Trout Dock guided trout fishing float trip means you'll drift down the White River, North Fork River or the Buffalo River in north-central Arkansas at a comfortable pace to fish as you watch scenery and wildlife. 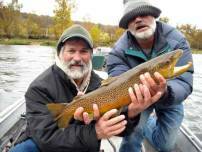 On the White River and North Fork River, we fish mainly for Rainbow Trout and Brown Trout. 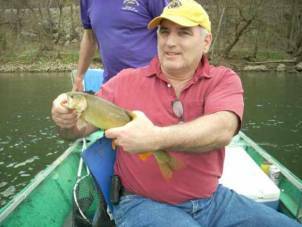 On the Buffalo River, it is mainly Smallmouth Bass. 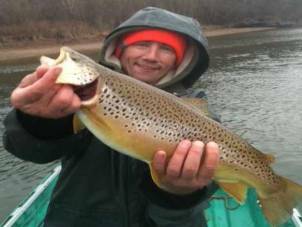 We think you will find a guided Arkansas trout fishing trip is one of the best bargains around. Some people; new to trout fishing, believe that "trout fishing" means that you have to fish with fly fishing gear. Most of the "locals" here and most of our guests do not use fly fishing gear; they use spinning or spincasting rods/reels. No experience required! Fly fishing is a wonderful sport and we take out many fly-fishers, but it is not the only way to fish for trout. 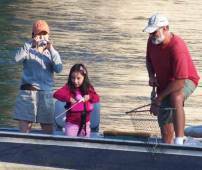 Fly fishing is becoming more and more popular over the years; around here as elsewhere. Your guide can do everything for you, including casting, or he can just get you there and let you catch the trout. Or anything in between these two extremes. Just depends on your experience, etc. Either way, stories and laughs will be provided. And if you choose, you may also enjoy a great White River, Arkansas trout fishing tradition; the shore lunch . In addition to our regular " day trips" we do "camp" trips. Our "camp" trips are more accurately "fish and then camp" trips. Our trout fishing and camping float trip is a truly therapeutic adventure. When the trout fishing day is over you'll camp on our private 15 acre wooded island. You'll enjoy a tasty steak dinner cooked over oak coals, then relax with your friends around the campfire until retiring to your tent to sleep on a comfortable cot. In the morning you'll watch our cooks prepare your breakfast over the campfire as you sip hot coffee. Over the last 54 years we've heard thousands of happy customers claim that our White River Arkansas Ozarks float trips are unforgettable fun and relaxation.Those who have never fished in their lives come away amazed at the fun they had, and how much they relaxed in such a short time. And the seasoned fishers make the same claim. There are a lot of things we love about this Arkansas trout fishing business; our guests, our guides and just the rivers. But the best thing is to see the difference in brand new guests from the time they arrive to the time they get back to the dock at the end of the day. You can sometimes see some tension and worry on their faces when they walk in our door for the first time. When they get back to the dock after fishing, it's all gone. That truly is the best part of our day, and Debbie and I just look at each other and smile 'cause we knew it was going to happen. Always does. 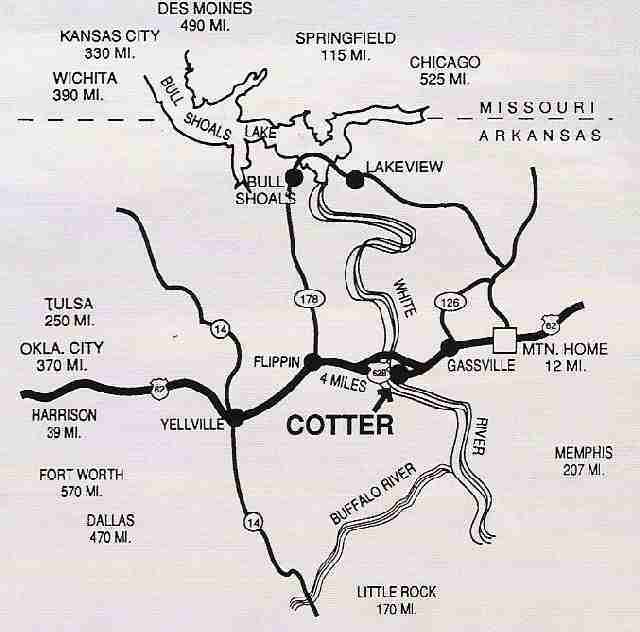 For over 50 Years Cotter Trout Dock has been conducting exceptional guided trout fishing float trips and camping float trips on Arkansas' White River and North Fork River and smal lmouth bass fishing trips on the Buffalo National River in Northern Arkansas. We are a Buffalo National Scenic River (National Park Service) approved fishing and camping outfitter. On Buffalo River trips, we camp on riverbank gravel bars at the rivers edge. 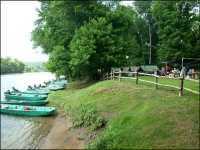 For White River camp trips, Cotter Trout Dock owns Smith Island our private 15 acre island at the confluence of the White River and Buffalo River. Our favorite trip is 24 miles down the Buffalo River through two Wilderness Areas; camping one night on the Buffalo River and the second night on our island on the White River, then fish 12 more miles on the White River to Norfork. 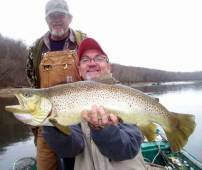 Cotter Trout Dock guided trout fishing trips are great for family vacations, customer appreciation and employee reward groups or just one boat full of friends. Fully Licensed and Insured. Established 1954. The cold, crystal clear White River flows from Bull Shoals Dam 18 miles above Cotter, Arkansas, our starting base. For the next 60 miles its chilled waters are perfect for rainbow, brown, and cutthroat trout, as well as providing natural air conditioning that keeps you comfortable even during July and August. The Arkansas White River receives regular trout stocking, plus it has good populations of native trout. The White River in Arkansas is the producer of several trout World Records. 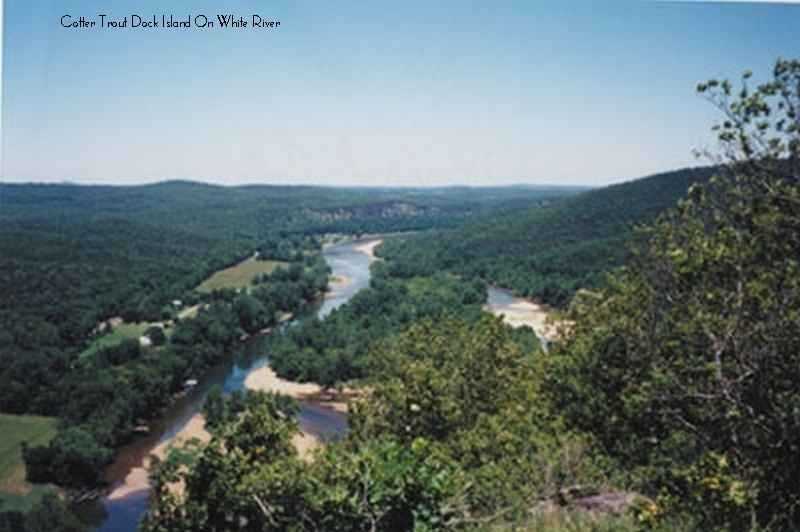 The scenery is primarily Arkansas Ozark forests and bluffs with some open fields. There are homes along the river banks in some areas, but for the most part the scenery is primitive. You'll see several types of animals, birds (including blue herons and eagles), and wildflowers along the way. 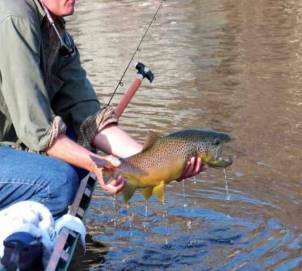 Brown trout like this one are not uncommon in the White River; we see our guests catch many every year. You'll also catch rainbows, cutthroats, and brook trout. Rainbows are much more abundant than browns and most of our guests fish mainly for rainbows. Our Arkansas trout fishing float trips range in length from a half day trip to camping trips of several days covering about fifteen miles per day. All trips are fully outfitted with all you need for a safe, comfortable excursion. Our guided fishing trips are conducted by professional, well-trained guides with many years experience. Lots of stories! And they are great cooks over a charcoal fire. We are famous for our excellent shore lunches and camp meals. We are happy to "put-you-in" at any point on the rivers and "take-you-out" at any point on any river. 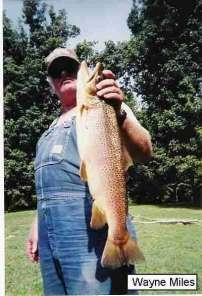 Our normal trip leaves the Cotter Trout Dock dock at 7:00 AM and you fish 10-12 miles to near or below Crooked Creek. We then work our way back to our dock arriving at 3:30. Cotter Trout Dock is open all year around. We've been in the same location since 1954; just after trout were introduced into the Arkansas White River. We are fully licensed and insured. We are very safety conscious and are inspected by the National Park Service on a regular basis. We do not have any hidden charges. When you book your fishing trip with Cotter Trout Dock, we'll make your room reservations at the accommodation of your choice. We'll be happy to make reservations at restaurants or attractions for your group. For corporate groups we can pay for rooms, meals etc., and your company can write one check to us. We'll be happy to pick you up at either the Marion County Airport in Flippin or the Baxter County Airport in Mountain Home and provide transportation between the dock and your motel accommodations at no extra charge. We gladly provide rods and reels at no charge. Cotter Trout Dock owns a 15 acre island in the middle of the Arkansas White River directly in front of the mouth of the Buffalo River. Your privacy and solitude is guaranteed! We maintain multiple grassy, shaded camp sites on our island so that we do not need to combine groups. Your campsite is for your group alone. This private campground is for our overnight float trip guests only. Overnight trips are from 2 to 6 days. 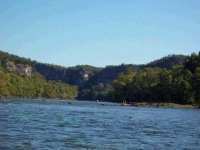 Depending on the length of your trip and water conditions, you might elect to float both the Buffalo National River and the White River; or float the North Fork and White Rivers. All trips are tailored to your individual requirements. Smell The Coffee .. . And The Bacon . . . And The Steaks. 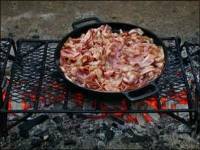 Campfire bacon frying over oak coals is one of many tasty dishes our skilled cooks prepare on camping float trips. 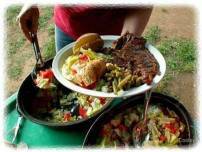 At Cotter Trout Dock in Cotter, Arkansas, we are famous for our shore lunches and camp cooking. Field & Stream and other outdoor magazines have written several articles about us, and they all raved about our meals. But the article we are most proud of is one that appeared in Gourmet Magazine. They had many good things to say about our meal and our guides. We bet you will too! We use top quality ingredients like corn-fed beef, hand-picked tomatoes, and cooks who know what to do with them. You may change the menu to accommodate the tastes and diets of your group - low fat, Kosher, etc. You'll need to bring your own alcohol, but we can special order anything else. 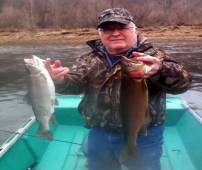 From beginners to advanced fishers, people of all ages, have enjoyed Cotter Trout Dock float trips for over 50 years. Our guests ages range from 3 years old to ninety years old. We can tailor our trips to meet your needs. Guided float fishing is all we do and we are highly devoted to creating the best trip possible. Float fishing and camping in the Arkansas Ozarks is an experience unlike that found anywhere else in the Western Hemisphere. It is a luxury outdoor living and fishing experience that never fails to satisfy our guests. This quality level has taken us years of hard work to achieve and we put it to work for you. We're large enough to accommodate any size group, but small enough to tailor our trips to your individual requirements. We float fish all the trout waters of the White and North Fork Rivers generally covering 10-12 miles of river per day. All our trips are float trips - we never just go out a mile or two from the dock and stay there. We travel to where our guides know the fish are. This gets you away from the public access to where the fishing is better and the scenery is beautiful. We fish from traditional White River Arkansas John boats. All boats are fully outfitted with comfortable, padded swivel seats, life jackets, and throw cushions. Our guides either own or are assigned their own motors and equipment. Motors and equipment are well maintained and clean. Thanks for reading clear down to here! 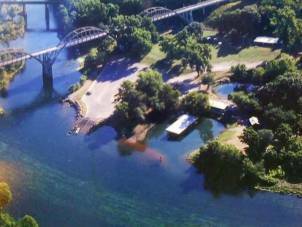 Come on over and see why most of our customers are family vacations or groups that come to Cotter Trout Dock at Cotter, Arkansas every year, year after year, to enjoy some of the best trout fishing in America. Arkansas trout fishing - it's the best! Free downloadable brochures that are easy to print. Fishing, hunting guides and many more. Great info. Fishing license information. Get your license online or get it when you get here. Weekly Arkansas Game and Fish Commission Fishing Reports. Sign up to get in your email if you want. The local Baxter Bulletin Newspaper located in Mountain Home has a good weather site. Another fine weather site from Ozark Mountain Websites by Gary Cooley. Quick loading little map with mileage from Cotter to major cities. Also, see our Directions page. Cotter's Trout Capital USA website. Fine site with lots of info about Cotter. Harrison, Arkansas Convention and Visitors Bureau. Located about 4-5 miles away in Gassville. Located about 9 miles downriver from us. Located about two blocks from our dock in Cotter. Located about 2 miles upriver from us. Located about 5 miles downriver from us.